Survey shows that serious credit dings are common among recent grads. Graduation brings a lot of changes for college students. And while the first couple years out of school can be exciting, they’re also dotted with pitfalls—including financial ones. Recently, high schools and colleges have stepped up financial literacy initiatives to prepare students for real-world money management. But many of these efforts have been lackluster, with a recent assessment giving 50 percent of state programs a grade of “C” or lower. To explore credit damage among recent college grads, we asked 500 members of the class of 2016 about their money habits since finishing school. With just two years behind them, an overwhelming majority—seven in ten—reported major financial missteps. All of these are known to lower a consumer’s credit score, and the damage lasts. The impact of a particular infraction will vary according to a number of different factors, but Equifax, one of the three major credit bureaus, found that a single 30-day missed payment can lower a FICO score by 60 to 110 points for a borrower with fair to excellent credit. Additionally, once a black mark is recorded on a credit report, it stays there for a long time—seven years. These dings can eventually be offset, but repairing them takes time and a consistent track record of credit-boosting behavior. 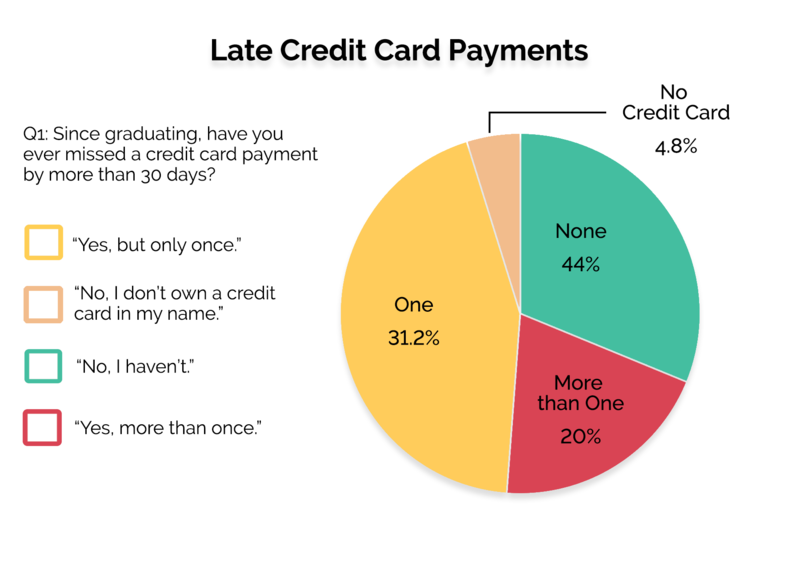 Late credit card payments were the most common money mistake for recent grads. Fifty-one percent of respondents said they had paid a bill more than 30 days late, which means the payment would fall outside of typical grace periods and prompt reporting to the credit bureaus. Twenty percent said they had done it more than once. The second most common misstep was late loan payments, with 45 percent of respondents reporting payments that fell outside of typical grace periods. 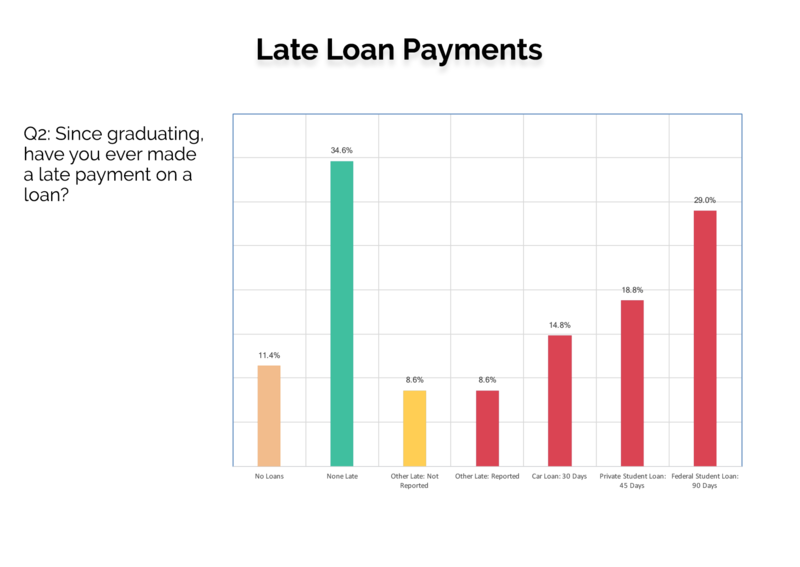 Student loans were the type of loan most often missed, with 29 percent of respondents missing payments on federal loans and 19 percent missing payments to private lenders. Next came car loans, with 15 percent of respondents missing payments by 30 days or more. 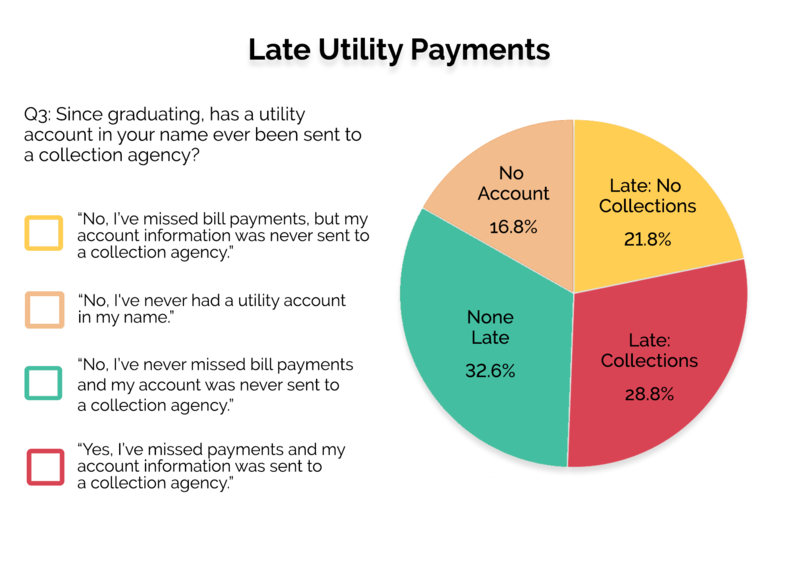 Utility companies (phone, electricity, and internet for example) rarely report on-time payments to the credit bureaus. However, they do report late payments—especially if an account is sent to a collection agency. Twenty-nine percent of respondents said an account in their name had been sent to collections. Though FICO does not disclose its credit-scoring algorithm, credit card debt that exceeds 30 percent of a card’s credit limit is widely acknowledged to negatively impact a borrower’s credit score. 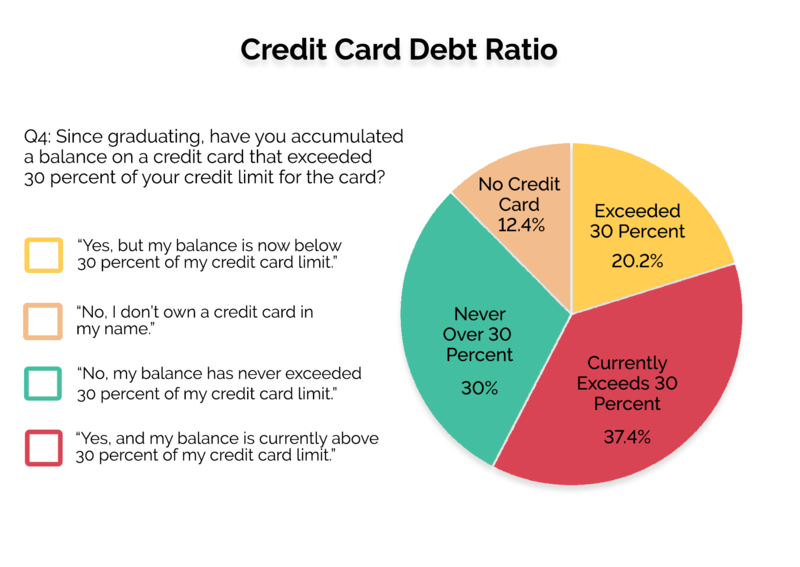 Among the grads surveyed, 58 percent said they had exceeded 30 percent of their card’s credit limit since graduation. Thirty-seven percent said they still carried credit card debt above that level. This survey shows that the first two years after college are fraught with financial risk, and many graduates have trouble navigating it. On some level, this might not be surprising. For many students, graduation ushers in their first exposure to real-world finances—they get jobs, rent apartments, buy cars, and use credit cards without a parent watching over them. Missing a payment or two might seem inevitable, but when those missteps end up on their credit report, those early mistakes have lasting consequences. Improving financial literacy among college students is one possible solution, and a growing number of schools have implemented programs to boost financial wellness among their students. These efforts underscore the importance of financial literacy, and the role that colleges can play in preparing students for financial success as independent adults. OppLoans contracted the polling company Pollfish to conduct a survey of 500 college graduates who finished school in the spring of 2016. The survey ran from March 29 to April 3, 2018. Respondents were between the ages of 23 and 25. Fifty-six percent were female and 44 percent were male. Respondents self-reported financial behavior for the two years since graduating from college. The survey used a nonprobability sampling method. The sample size was statistically significant.